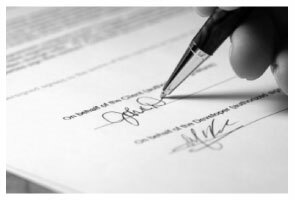 A deed that is executed and delivered by the person transferring the estate or interest, or that person's attorney, will be sufficient to convey land or interest in land in Massachusetts, without any other act or ceremony (183.1). If an estate or interest in land is not in writing and signed by the grantor or his attorney, it will have the effect of an estate at will only, and no estate or interest in land will be assigned, granted, or surrendered (183.3). The statutory forms provided in the Massachusetts General Laws are sufficient for a conveyance and may be used for such purposes. The authorization of these forms does not prohibit the use of other forms. They can be altered as circumstances require. Any person of lawful age who can enter into a legal contract has the authority to hold and convey real property or an interest in real property in this state. The Massachusetts General Laws provide information on who is entitled to convey real property. Corporations in this state are given the power to hold and convey real property. Additionally, in the Commonwealth of Massachusetts, an alien has the authority to take, hold, transmit, and convey real property. No title to real property will be invalid on account of the alienage of the former owner (184.1). If a conveyance of land is otherwise valid, it shall, notwithstanding adverse possession, be as effectual to transfer the title of the grantor as if he or she were actually seized and in possession of such land (183.7). Real property or interest in real property can be conveyed to individuals, corporations, or to two or more people. The way in which property is owned will determine the owner's rights as well as the method of conveyance. A deed cannot be recorded in Massachusetts unless a certificate of its acknowledgement or of the proof of its execution is endorsed upon the deed or attached to it. The certificate will be recorded with the deed (183.29). A real estate deed must include a recitation of the grantee's mailing address and a statement of the full consideration for the conveyance (183.6). The grantor executing the deed must also acknowledge it. If acknowledgements are made within Massachusetts, they can be made before a justice of the peace or notary public (183.30). If acknowledged outside of Massachusetts, acknowledgements can be made before anyone authorized to acknowledge deeds, as long as a certificate of authority is attached to the instrument (183.30). The forms provided in the Massachusetts General Laws for a certificate of acknowledgment and a certificate of authority can be used, but their authorization does not prevent the use of other forms (183.42). There are at least three counties in Massachusetts that have created land banks, which are conservation entities that were created to preserve open space and the natural wonder of the land. Each land bank has different requirements concerning the recordation of documents. For assistance with this and other issues such as formatting and relevant information to include in the deed in order to have it recorded, visit the appropriate county. A conveyance will not be valid against any person other than the grantor, his heirs, and devisees, and persons having actual notice of it, unless it is recorded with the registry of deeds in the county or district in which the property lies (183.4). The record of a deed, duly acknowledged or proved, is conclusive evidence of the delivery of such instrument, in favor of purchasers for value without notice claiming thereunder (183.5). Ronald M. said: Easy to use but can't seem to find LOGOUT control???? Robert S. said: Documents available immediately as advertised. Was easy to understand the guide and complete the deed form for notarization and filing for recording. Reply from Staff: Thank you for your feedback Karen. We really appreciate it. Enjoy your day! Pamela F. said: Very easy to use and had my forms paid for and downloaded very quickly. Reply from Staff: Thank you for your feedback Pamela. Have a fantastic day! Tawnya B. said: The document I needed and easy instructions!